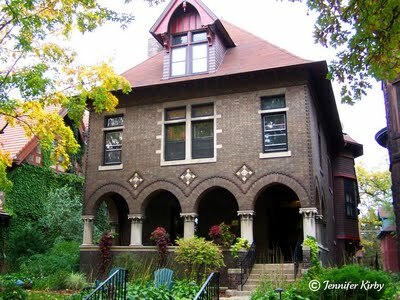 This weeks showcase Historic Home is 339 Summit Avenue. Built in 1898 by Crawford Livingston at a cost of $14,000, the home was designed by the famous Cass Gilbert. With a Gothic / Medieval design, there is no other home quite like it in the area. Whereas most homes have a distinct porch, this home is designed with the second story coming forward to be flush with the lower story. The arches are very beautifully done with the short Corinthian columns, and the diamond shaped spandrels are very unique. Originally built as a single family residence, the home is presently divided into 5 condominiums, each having two bedrooms and somewhere between 1400-1800 square feet. The last condo unit sold in 2002 for $275,000. If the home were to sell today as one building, it would fetch well over $1 Million. I found two old photos of the home. The first was taken in 1902, the home being the second from the left. You can really see how the streetscape looked at the turn of the 20th Century. The second is from 1973, during winter. The home thankfully has not been altered on the exterior throughout it’s lifetime. This entry was posted on Wednesday, April 2nd, 2008 at 2:03 pm	and is filed under Gothic. You can follow any responses to this entry through the RSS 2.0 feed. You can leave a response, or trackback from your own site.